Yes. She matched pitch at least once! This week we take obedience to the next level as we study Obstacles to Obedience. I have a feeling that the biggest obstacle is US!!!! Or PRIDE!!!!! Should we take wagers? Oh, that’s not good. (For those of you who don’t know, our city is about to vote on whether or not to pursue a casino gambling license!) Lots of exclamation points today! Reminds me of a Seinfeld episode! Man, it’s gonna be a good day. Don’t miss it! Man, I’ve really got to catch you guys up. Here’s a video from a few weeks ago, maybe a month. Anyway, it’s a Kate original. You think I’m gonna be trying to sell my house in this post don’t you? Well, this post isn’t about that. Unless of course, you need a house in Rainbow City, AL. In which case, I’ve got a nice one for you. No, it’s not about that. My friend is also trying to sell a house and I think he’s gotten it right. He’s observant. He’s smart. He travels a lot so he’s seen it all. It works for car dealerships. Why not houses? If inflatable gorrillas sell cars maybe inflatable dinosaurs sell houses. If it works, you bet I’ll put one up in front of mine. 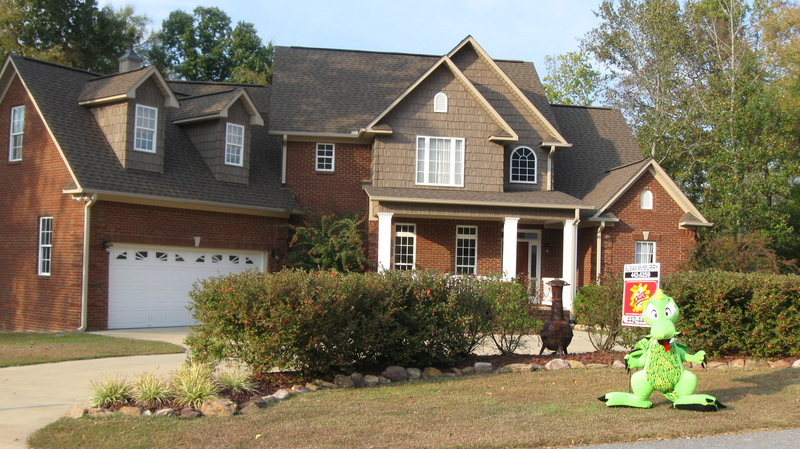 Did I mention that I have a house to sell in a nice neighborhood in Rainbow City, AL? Then the men were exceedingly afraid and said to him, “What is this that you have done!” For the men knew that he was fleeing from the presence of the Lord, because he had told them. Jonah knew what he was doing. In disobeying God he was giving up intimate fellowship with Him. But do we realize that? Do we really consider the consequences of saying “No” to God or failing to say “Yes” when He calls? Many Christians wonder why they don’t have a closer walk with the Lord. Many don’t even believe one exists. There are many reasons why this could be so, but I wonder if one of the biggest is disobedience. How many Christians sit and wonder why they don’t know God more, why they don’t hear His voice or sense His awesome presence, yet harbor an area of incomplete obedience or full out disobedience? Well, I can’t say much more. Now you have to seek Him. If you’re one of those (Hey, I’ve been there for sure) who wonder if there is more, or wonder what happened to the close relationship you once had with the Lord, ask for His guidance. Ask Him, as David did (Psalm 139), to search you and know your heart. To try you and know your thoughts. To see if there is any offensive way in you and lead you in the way everlasting. Oh, He already knows. The progress comes when He reveals it to you and you turn to Him. He’s waiting for you. Praise God, He waits for us. Can’t you see Romans 12:1 in there? He’s saying that we should think about the grace of God. Think about our salvation and what that means in our lives. We should be different. Because of our salvation: we should live differently and we should be eagerly working for our Lord! (“zealous for good works)”. But when the goodness and loving kindness of God our Savior appeared, he saved us, not because of works done by us in righteousness, but according to his own mercy, by the washing of regeneration and renewal of the Holy Spirit, whom he poured out on us richly through Jesus Christ our Savior, so that being justified by his grace we might become heirs according to the hope of eternal life. The saying is trustworthy, and I want you to insist on these things, so that those who have believed in God may be careful to devote themselves to good works. These things are excellent and profitable for people. What a description of the gospel. But remember, he’s not writing to lost people. He’s writing to the church, the saved, the saints, His servants. He’s saying that we should be talking about the gospel. We should be discussing God and who He is. His love. His goodness. His grace. We should explore His attributes. Understanding who He is makes what He did for us even more amazing. Then we should explore what He did for us. Talk about salvation: our sin, Jesus Christ, the cross, the resurrection. We should search the scriptures to know what that means for us. Is it just fire insurance? Or is it more? Are we just waiting on heaven or does it change us here? We are heirs now! We are His children through adoption by His blood. Why should we continually teach these things? Did you see the “so that?” Of course you did, I put it in bold print. So that we – the church, the people of God, His children – would devote our selves to good works. It’s Romans 12:1. Therefore, I urge you, brothers, in view of God’s mercy, to offer your bodies as living sacrifices,holy and pleasing to God–this is your spiritual act of worship. What’s he saying? Something like, go serve like it’s worship to a holy, loving God who wondrously saved you by the sacrifice of His Son and has showered you with blessings beyond our finite human imaginations. Something like that.